Blimey post 12 and I feel I’m only at the tip of the iceberg..having emptied the room lurking behind that door which is great, yes I can now decorate it, use it, not feel ashamed of it, but all I’ve really done is created a mountain of stuff now hiding in the room behind the kitchen. In post 2 getting started I mentioned I would move my clutter from one room to another that way I would only have the one room to finally declutter not two and that’s where I’m finally at 3 months into this blog. In 8 years I’ve only ever managed to stack up the boxes send a bit off to charity not really get stuck in, so now this is it…no more moving stuff out of site to another room this is the real deal the room behind the kitchen is neatly stacked with boxes, as I took every thing out again last week, this time spreading all over the kitchen not on tarpaulin in the garden, its gone too cold for that and piled it all back in neat rows so I can squeeze in between the boxes if i need anything off the shelves at the back. 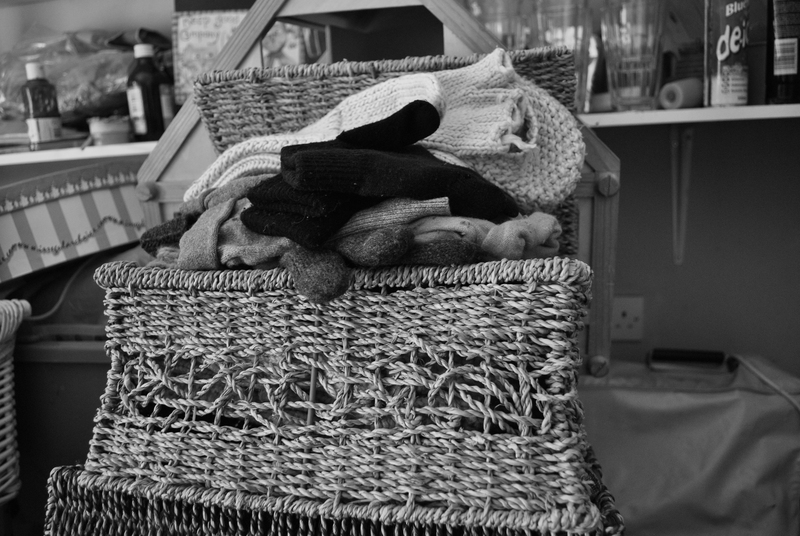 I paired up gloves and found scarfs and put them in nice baskets, gave a few childrens coats to friends took some items to charity and binned things. So I feel like this is the real start to my decluttering I’m sure I will find distractions along the way I know the kitchen cupboards are so full they need a good sort out but that’s not tackling the room behind the kitchen and once I stumble across the box of my mums Shrewsbury pattern coalport she used to collect, god know what I do with that and then there the lovely thing which I know we cant part with but is too big to keep in the house once we are all sorted but hey that’s months away yet.